The mission objective of the Voyager Interstellar Mission (VIM) is to extend the NASA exploration of the solar system beyond the neighborhood of the outer planets to the outer limits of the Sun's sphere of influence, and possibly beyond. This extended mission is continuing to characterize the outer solar system environment and search for the heliopause boundary, the outer limits of the Sun's magnetic field and outward flow of the solar wind. Penetration of the heliopause boundary between the solar wind and the interstellar medium will allow measurements to be made of the interstellar fields, particles and waves unaffected by the solar wind. The VIM is an extension of the Voyager primary mission that was completed in 1989 with the close flyby of Neptune by the Voyager 2 spacecraft. Neptune was the final outer planet visited by a Voyager spacecraft. Voyager 1 completed its planned close flybys of the Jupiter and Saturn planetary systems while Voyager 2, in addition to its own close flybys of Jupiter and Saturn, completed close flybys of the remaining two gas giants, Uranus and Neptune. At the start of the VIM, the two Voyager spacecraft had been in flight for over 12 years having been launched in August (Voyager 2) and September (Voyager 1), 1977. Voyager 1 was at a distance of approximately 40 AU (Astronomical Unit - mean distance of Earth from the Sun, 150 million kilometers) from the Sun, and Voyager 2 was at a distance of approximately 31 AU. It is appropriate to consider the VIM as three distinct phases: the termination shock, heliosheath exploration, and interstellar exploration phases. The two Voyager spacecraft began the VIM operating in an environment controlled by the Sun's magnetic field with the plasma particles being dominated by those contained in the expanding supersonic solar wind. This is the characteristic environment of the termination shock phase. At some distance from the Sun, the supersonic solar wind is held back from further expansion by the interstellar wind. The first feature encountered by a spacecraft as a result of this interstellar wind/solar wind interaction was the termination shock where the solar wind slows from supersonic to subsonic speed and large changes in plasma flow direction and magnetic field orientation occur. Voyager 1 is escaping the solar system at a speed of about 3.6 AU per year, 35 degrees out of the ecliptic plane to the north, in the general direction of the Solar Apex (the direction of the Sun's motion relative to nearby stars). Voyager 2 is also escaping the solar system at a speed of about 3.3 AU per year, 48 degrees out of the ecliptic plane to the south. To check Voyager 1 and 2’s current distance from the sun, visit the mission status page. Passage through the termination shock ended the termination shock phase and began the heliosheath exploration phase. The heliosheath is the outer layer of the bubble the sun blows around itself (the heliosphere). It is still dominated by the Sun’s magnetic field and particles contained in the solar wind. Voyager 1 crossed the termination shock at 94 AU in December 2004 and Voyager 2 crossed at 84 AU in August 2007. 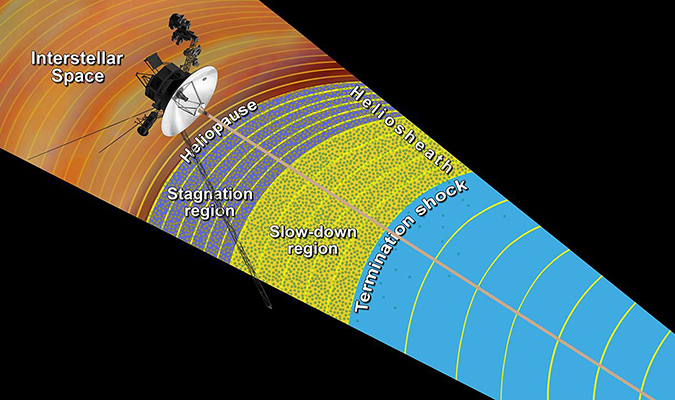 After passage through the termination shock, the Voyager team eagerly awaited each spacecraft's passage through the heliopause. which is the outer extent of the Sun's magnetic field and solar wind. In this region, the Sun's influence wanes and the beginning of interstellar space can be sensed. It is where the million-mile-per-hour solar winds slows to about 250,000 miles per hour—the first indication that the wind is nearing the heliopause. On Aug. 25, 2012, Voyager 1 flew beyond the heliopause and entered interstellar space, making it the first human-made object to explore this new territory. At the time, it was at a distance of about 122 AU, or about 11 billion miles (18 billion kilometers) from the sun. This kind of interstellar exploration is the ultimate goal of the Voyager Interstellar Mission. 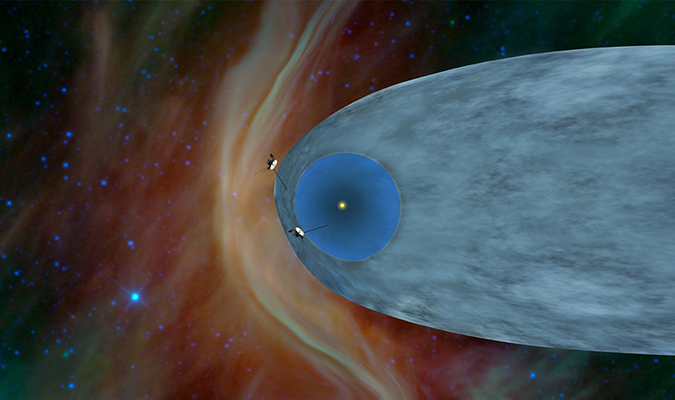 Voyager 2, which is traveling in a different direction from Voyager 1, crossed the heliopause into interstellar space on November 5, 2018. The Voyagers have enough electrical power and thruster fuel to keep its current suite of science instruments on until at least 2020. By that time, Voyager 1 will be about 13.8 billion miles (22.1 billion kilometers) from the Sun and Voyager 2 will be 11.4 billion miles (18.4 billion kilometers) away. Eventually, the Voyagers will pass other stars. In about 40,000 years, Voyager 1 will drift within 1.6 light-years (9.3 trillion miles) of AC+79 3888, a star in the constellation of Camelopardalis which is heading toward the constellation Ophiuchus. In about 40,000 years, Voyager 2 will pass 1.7 light-years (9.7 trillion miles) from the star Ross 248 and in about 296,000 years, it will pass 4.3 light-years (25 trillion miles) from Sirius, the brightest star in the sky. The Voyagers are destined—perhaps eternally—to wander the Milky Way. Launch: Voyager 2 launched on August 20, 1977, from Cape Canaveral, Florida aboard a Titan-Centaur rocket. On September 5, Voyager 1 launched, also from Cape Canaveral aboard a Titan-Centaur rocket.